so far so chic: Paraben-Free for Perfect Skin? You know that question, ‘If you could change one thing about yourself physically, what would it be?’ Well I’m far from perfect, but I could go to the gym, and I could stop eating chocolate, which would blitz my body worries; I wouldn’t use my ‘one thing’ on that. What I want, Mr Genie, if you’re asking, is perfect skin. After suffering from a spotty face for quite a few years, I’m conscious of every scar and open pore. Although the spots are (mostly) gone now, thank god, my magnifying mirror obsession remains. And it’s not just my face I fixate on; the skin on my body isn't perfect either. It get’s dry, it’s pale and even turns a bit purple in winter! I covet that Eva Mendes glow, like gently polished gold. I’m obsessed with exfoliating, both face and body. I feel like my skin doesn’t do it efficiently enough itself so I have to help it along. I get those weird upper-arm bumps, which make you look as if you never go outside. ‘Keratosis Pilaris’ is the medical name. 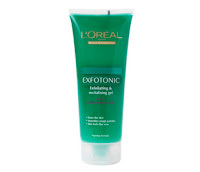 I use L’Oreal Exfotonic every day to try to keep my arms bump-free. With AHAs to melt away dead skin cells, as well as rough ‘scrubbie’ bits, it’s the only scrub I've tried that actually smoothes skin. As a result of all this scrubbing I don’t really get the bumps, just the marks from the bumps, ie pink dots. Still not good. While preparing to write this post I accidently came across an interesting piece on The Paraben Free Princess, in which a reader explains that her KP disappeared almost immediately upon switching to paraben-free products. I have to admit, I’ll choose Redken over 'Natural Aloe Shampoo' any day, so to test this theory would be a real stretch for me and my hair. I expect my beloved Exfotonic would be out too. But I really do detest these bumps… After some more research on treatments for KP I'll report back. My hair may smell of Aloe when I do. Fantastic, I'm definitely going to check it out! I mentioned it to Sarah at London Beauty Review on her post about Sanctuary Microdermabrasion Body Renewal as well. Thanks to Vaseline my arms are dry as old bark. Superdrug! They always seem to have it. I've found that Boots only have it sporadically.